Last year the contest was run in conjunction with Red Cross op shops, and the almost hardest part for me was cruising round all the Red Cross shops in Perth looking for raw materials. None of them were very close to where I live! This year you can buy the original garments from any op shop, or indeed use something out of your own stash or wardrobe, which makes it easier. There are also two categories, the judges choice and the peoples choice, and twice the number of prizes. Seriously exciting! I already have some ideas buzzing around in my head, just need to find time to go shopping for the ingredients! Four whole months virtually, and no blogging. That’s just being really, really slack, and I have no excuse. So I’m not going to make excuses, but just carry on gracefully as if nothing had happened. 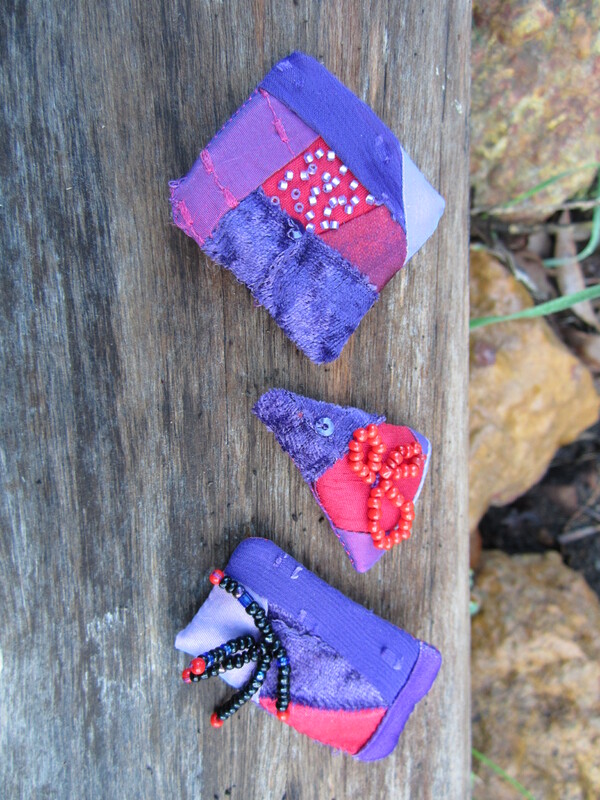 Recently I went to an 80th birthday party of a friend, and wanting to take a gift I made some more of the patchwork brooches or pins that I have made before. I’m not sure these were quite so successful, here they are. They are actually red and purple, but purple is really difficult to get right in photos. I don’t know why, but they just don’t seem quite right. The triangle one is a little too small I think, and I just didn’t take enough care over the selection of the fabrics, and the placement of the pieces. However, they served their purpose. I have several other projects in the pipeline, but definitely not in the blogging-about phase yet. However, I was very happy with my entry in the Australian Sewing Guild’s Castaway to Couture competition. The idea was to buy a garment or garments from a Red Cross opportunity or thrift shop, and recycle or upcycle it or them into a new garment. This is my entry, and the others can still be seen on the Guild’s Facebook page here. I know I’ve been really slack at posting when I come back to the WordPress site and none of it is familiar! OK, that’s not entirely true, some of it looks the same, but other bits seem totally different. When did that happen? Obviously I haven’t been paying enough attention. More attention than the person who sent me one email recently though. To be fair, the email wasn’t directed just at me, it was a bulk mailing from a list I subscribe to. Touting a webinar on ‘better blogging’ or something like that. They lost me in the first sentence though, which read “Weather you blog for family and friends, or to promote your business…”. Their spelling mistake, not mine! Seriously, if you are going to promote yourself as advising people on how to write, please spell check more effectively than that! OK, rant over. What else has been happening? I sent my entries off to the Sydney Royal, and I know that this year they arrived in time, because I tracked them on Australia Post. The show starts in two days, so I guess the judging is happening about now, but I’m not sure when the results come out. I’m not expecting anything great, just pleased with myself that this year I got the entries there in time. I hope at least to get to know the judges’ comments, that was one of the most instructive bits about entering some things in the Perth Royal Show a couple of years ago. I’ve been busy working on a couple of other things, and also decorating my bedroom, as well as trying to keep the garden tidy. We had rain (the first for many weeks) about 10 days ago, and the weather is getting cooler and more pleasant, so that I can raise some enthusiasm about gardening again. I ordered some spring bulbs, so I shall have those to plant in a week or two. I have promised myself I’m going to try to look after them this year, so that hopefully they will flower for more than one year, instead of just vanishing after the first season. I ordered Dutch irises, anemones, ranunculus (ranunculi? ), hyacinths, freesias, bluebells, and a few other things I’d never heard of before, but which looked good in the photo! Optimism springs eternally – I guess that’s pretty much the point about optimism, it’s always there. 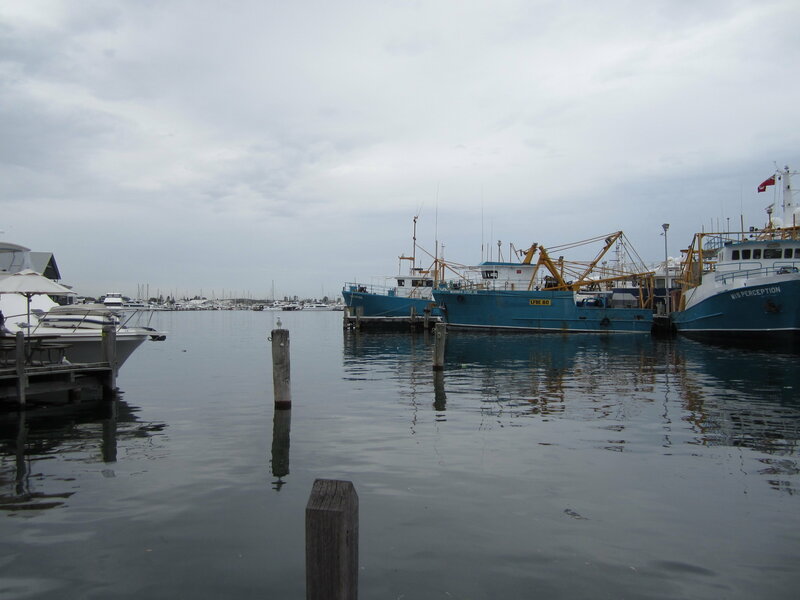 Also spent a weekend in Fremantle recently, and took this photo, which I quite like. Although, it’s probably hard to take an ugly photo of boats, they’re generally attractive things. 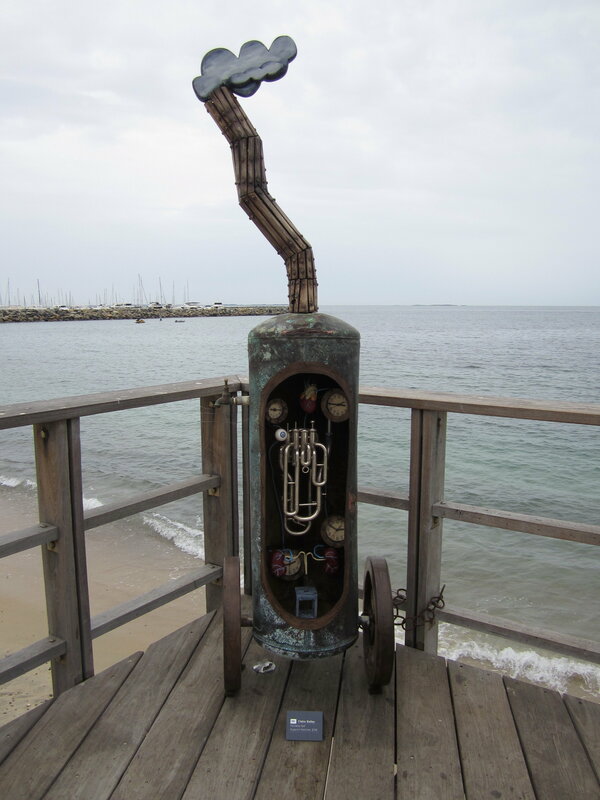 There was also an exhibition of sculptures on Bather’s Beach, I think I liked this one the best. I’ve often thought it would be nice to have something like that in the garden – what do you think? Now that I have finished a few other things, I am thinking about a new project. Another motivator is that summer is coming, it will be too hot to do much outside, so I find myself doing more sewing and crafting during the summer than the winter. I’ve been looking at entering competitions again. Competitive sewing is something I’d like to do more of, although the opportunities are a bit limited, particularly in Australia. One avenue of competition is the various agricultural shows held around the country, and although most of them are in spring, the Sydney Royal is held over Easter. After my experience last year, I am decided on two things. First, I will get my entry or entries finished and mailed in good time. Second, I will make something which is easier to mail! I downloaded the schedule, from here, and have been studying it. It’s a bit disappointing though, because just as I am reviving my interest in dressmaking, or at least garment sewing, there are only three classes in that category. There are options for garments in some of the other categories, like embroidery, beading, felting etc., but I know my skills in those areas are nowhere near up to the challenge. 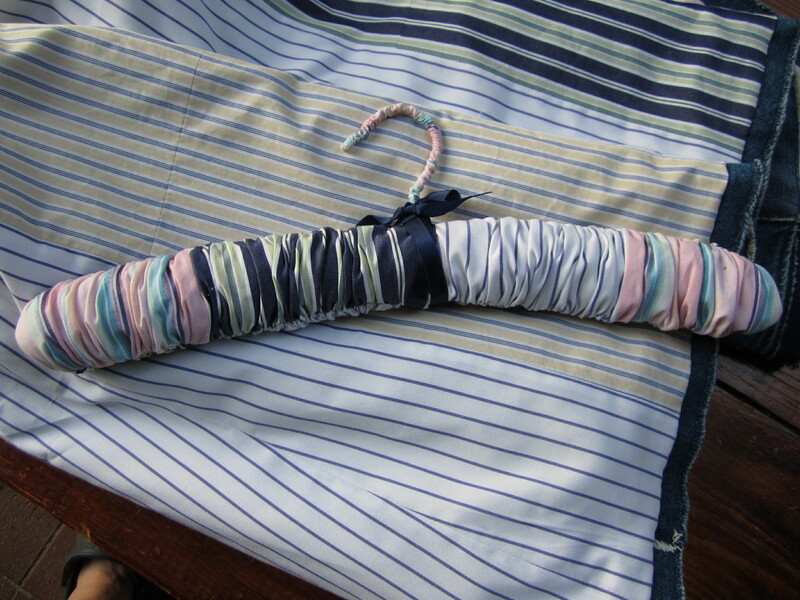 And of those three classes, one is for a mixed media article, I’m not sure that really counts as dressmaking. However, I do have an idea for the ‘wearable art of original design’ class. I acquired some odd pieces of what I think is actually a lightweight furnishing fabric last week, and I think I can collage or otherwise combine them into something. It will mean burrowing deep through the stash to find some other bits to go with them, but I’m sure there must be something suitable in there somewhere. I need to figure out when the entry needs to be finished, and create a time line back from there so that I make sure it can get in the mail soon enough. I wonder what other opportunities there are out there for competitive sewing? After the debacle with my entry for the Sydney Royal show, I made sure and sent off my entry for the Australian Cotton Fibre Expo in plenty of time. Sadly I still didn’t have any success, but at least I got it back OK, and can post photos of it now. Previously when I sent away a different denim vest for somebody to see it got lost in the mail, and I never did get it back. I’ve often wondered what happened to it. 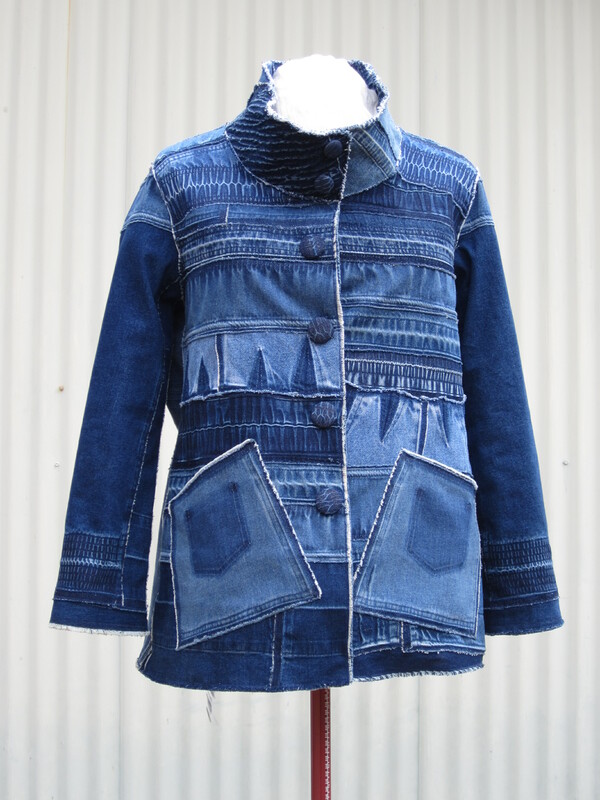 It’s made by unpicking the waistbands, hems etc of a number of denim garments (mostly children’s sourced from the op shop), and piecing them together to make the most of the patterns that are created when the denim fades. 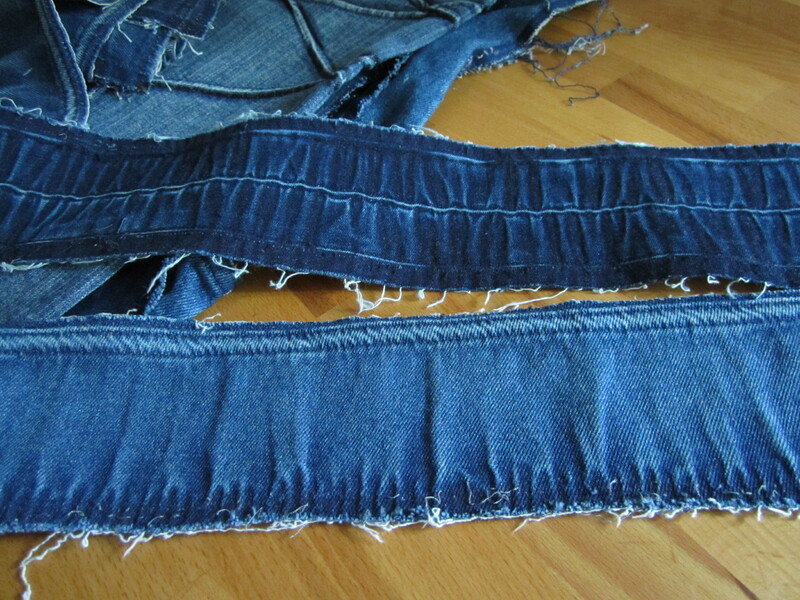 I’ve always loved denim as a fabric, and the way it takes on the character of the garment. 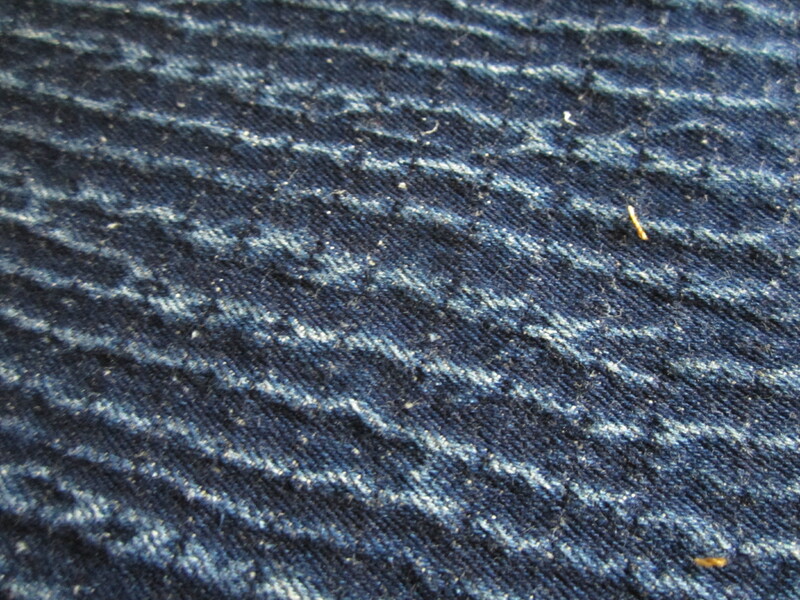 These are shots of some of the bits of fabric after unpicking. 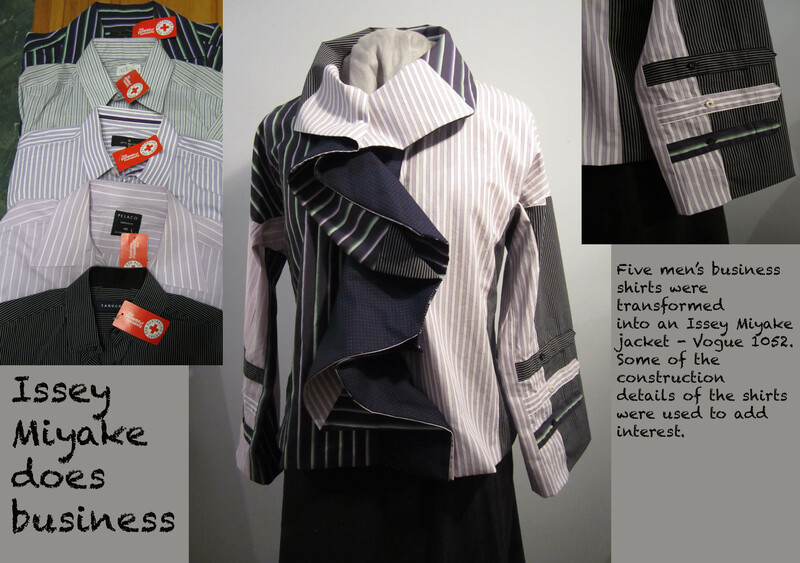 I even made the lining out of men’s business shirts cut up and pieced together. It was disapppointing not to be successful, but never mind. At least I have the jacket to wear. I don’t know what won, since the show was so far away there was no way of going to look at the other entries, and so far there is nothing on the website, in fact it looks as if the winners from last year haven’t been updated yet. All in all I’m feeling a bit ‘meh!’ at the moment. I just love that word, if word it is, for the way it so perfectly expresses the feeling. I am very tempted to start a new project, but I have to remind myself that I currently have too many projects I have started and am yet to finish. The kitchen, floor and other finishing touches, wardrobe in the spare room, at least 3 or 4 other sewing projects, and that’s just the ones that I can see without looking into the deep dark recesses of cupboards etc. I shall hope to enjoy the feeling of satisfaction and virtuousness (?) I get when I finally finish a few of them. That’s what I got this week. And as I was thinking that to myself, I wondered what a salutary lesson is, and is there another kind? I consulted the net to find the definition and origin of salutary, and apparently it means beneficial, coming from the Latin ‘salutaris’. Before anybody takes me up on that, I did only a quick search, and that’s close enough for this purpose. So a salutary lesson is a beneficial one, and I think there isn’t any other kind, surely all lessons are beneficial to some degree? However, I think there is a general feeling that a salutary lesson is one which is beneficial, but not particularly pleasant, a little like medicine, which has to taste awful to have any effect. My lesson, which really I ought to have learned by now, was not to leave things until the last minute. I had entered my Fremantle limestone embroidery in the Sydney Easter show, having been successful with it in Perth, and having seen an ad for the Sydney show in a magazine. The embroidery was made, obviously, since I had entered it in Perth in October last year, all I had to do was pack it up and send it off. In my defence, not quite so easy, since I had to find a box just the right size, and in the end I couldn’t and had to construct one out of two other boxes. However, I did that, and took it off to the Post Office with what I thought was just enough time. Fifty dollars for return postage, and that was that, or so I thought. Then on the weekend a phone message from the Show organisers. Please ring back. I did so, but the person I needed to speak to wasn’t there on the first attempt, or even on the second, so it was several days before I got to find out what the message was about. My entry hadn’t arrived until after the judging closed! Sorry, but there you are. So, a salutary lesson indeed, including in the sense of not being very pleasant. I’m now a bit worried whether my entry for the Cotton Expo arrived in time, since I also posted that, albeit Express Post. Fingers crossed. And in future, I will make sure to send any similar things off in good time, to allow for the abysmal performance of Australia Post. Don’t get me started! How lax I have been! Nearly three weeks since my last post. In my defence, I haven’t been doing nothing. I put an entry into the Australian Cotton Expo in the craft section, and have been beavering away at it. It really needs to be finished by this weekend so that I can take a photo and send it in before the entries close, but I don’t think it will be. I’m now frantically trying to figure out how much I need to finish in order to be able to take photos which will look as if it’s finished, if that makes sense. The entry conditions say that you have to send a sketch or photo of your entry, so it doesn’t have to be finished, a sketch could be of something which wasn’t even started yet. No hints on here as to what my entry is, that will have to wait until the contest is done, in about April I think. On the topic of competing, I also entered my wall hanging, Fremantle Limestone, in the Sydney Royal Show, just for a lark. At least that is already finished, I just have to find a way of packing it so that it can be posted, shouldn’t be too hard. Then I have an idea for another competition I saw mentioned recently . . . I can see this competing business is going to get a grip on me! So, the sewing has been taking priority lately, partly also because it’s mostly too hot to do much outside. Cooler weather forecast for this Sunday though, so I hope to catch up on a few jobs. Trouble is, my ‘to do’ list never gets any shorter. Anybody got any ideas? I went to the Perth Royal Show this week to see how my entries went, and much to my surprise I had won something! Actually, there were disappointingly few entries in the Machine Embroidery section, Hand Embroidery was much better supported. My wallhanging got first, out of two entries, the journal cover third out of two entries, and the pendant third also, although it was the only entry in the class so far as I could see. Obviously they don’t always give prizes if they think the standard isn’t high enough. That’s fair enough, and the wallhanging was certainly what I spent the most time on, so I am pleased that it won. I have to go pick the things up tomorrow, and I must take photos of them. I am already inspired to try again next year, and I think I shall have a go at hand embroidery, since that is where most of the entries are, and so more of a challenge. 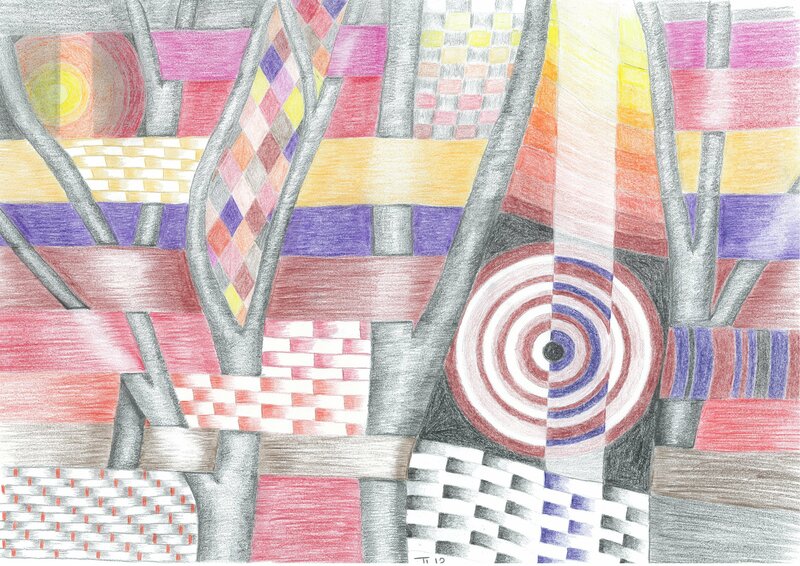 I have an idea for a piece, possibly canvas work but definitely some sort of counted thread, based roughly on the drawing I did for TAFE. I don’t remember if I ever posted a photo of it, but here it is. I think this could translate quite nicely, with the black and white bits being blackwork, and the colour being blackwork type stitches but done in colour. I have 12 months, give or take! I got the latest edition of the Itch’n to Stitch newsletter yesterday, it’s very informative. I have already found a competition to enter next year, and have the idea of what I am going to do all planned out, more or less anyway. Watch this space! The newsletter is full of things to do, workshops, exhibitions, contests etc., and must entail a great deal of work to put together. Really worthwhile thing to have landing in one’s mailbox, unlike so much of the other stuff that appears there.